Give your apples sun tattoos this summer! 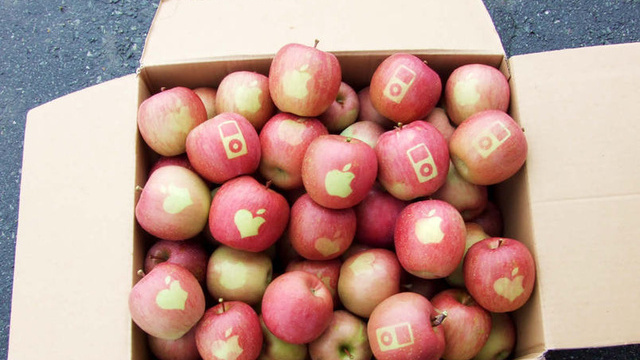 What would you "tattoo" your apples with? The concept of "sun tattoos" is not a recent one. If you have ever doodled anything on your skin with sunblock before going out in the sun, you have hit upon the basic premise. There are several companies that will sell you stickers that you apply to your body, so that you can get a white spot left behind on your tanned skin in the shape of, say, a heart or a butterfly. One fascinating artist even created a "tattoo robe," with cut-outs that create a beautiful floral motif on the skin after a day of hard-core sun tanning. But tanning your actual skin, in the actual sun? Not such a great idea. Skin cancer and all. Direct exposure to the sun's rays is harmful to our skin, but this is not true of the humble apple. Sunlight is what turns a red apple red (along with the right genetics - sunlight alone will not turn a green Granny Smith red). As you might have guessed by now, if sunlight turns a red apple variety's skin red, then blocking sunlight can leave a mark on the apple's skin as well. This is called a "tattoo," even though it isn't really a tattoo in the traditional sense. A man in Japan successfully "tattooed" a crop of Fuji apples with the Apple logo and the Apple iPod shape, thus creating the world's first Apple apples. Adorable! He waited until about a month from harvest, when the apples had reached their full size but had not yet changed color. He applied stickers to the apples, then sat back to wait until harvest time. If you have an apple tree, or if you raise other fruits or vegetables which change color in response to sunlight, this could be a great summer project. The easiest way to make your own apple tattoos is to buy some sheets of mailing labels. These will have white paper backed with adhesive, attached to a sheet of waxed paper. You can buy mailing labels in just about any size, including full-sheet labels which are one single sheet of 8x5x11 sticker. Depending on the design you choose (and whether or not you have young children who are helping), an X-Acto knife is probably going to be your best bet for cutting out the stickers. This will give you the control you need to cut out small shapes, like the triangle inside a letter A. What would you tattoo your apples with? A design, or your initials? How about an apple that literally says "EAT ME?!"